For lovers of Radha-Krishna Vrndavana lila and sadhakas doing yogapitha dhyana, we herein present Sri Krishna Dasa Kaviraja’s portrayal of Priya-Priyatam’s Vrndavana Yogapitha from the Govinda Lilamrta. Simhasana—Radha-Govinda’s simhasana (royal throne or seat). In the middle of the golden Yogapitha Mandir is a golden throne resting on the back of carved golden sunstone jewel lion with ruby eyes resting on his haunches. The ruby eyed lion supporting the simhasana (lion or royal throne/seat) has its front paws raised to appear like he’s flying. A golden umbrella spreads out above the simhasana. Surrounding Kunjas—Eight desire tree kunjas stand in eight directions around the Yogapitha Mandir. Each kunja has a small, jeweled cottage covered by intertwining desire creepers. Beyond the eight kunjas are circles of many more kunjas, each one double the size of the previous. There are circles of 8, 16, 32, 64, 128, 356, etc. individual kunjas around the Vrindavana Yogapitha. A Golden Glen—circle filled with jeweled paintings or statues of mating animals, birds and devatas to stimulate amorous feelings. Banana Grove—circle with thousands of banana trees full of ripened fruits, and cooling leaves due to natural camphor oozing from their trunks. Flower Gardens—circle blossoming with infinite varieties of inconceivably fragrant flowers. Fruit Orchards—with heavily laden trees bent down due to lots of juicy tasty fruits. Kunja Cottages—scattered among the various gardens and orchards wherein Vrnda’s vanadasis store paraphernalia for Radha-Madhava’s ratri-lila. Dense Forests—spread out beyond the orchards. Betelnut Tree Grove—with green, yellow and fully ripened fruits hanging within reach of the manjari’s graceful lotus stem arms. Coconut Groves—surround the entire area of Govinda-sthali Maha Yogapitha and border Yamunaji. The continuous line of trees looks like a necklace around the island. Keli Nikunjas—beyond the coconut groves and near Yamunaji’s banks are hundreds of secluded intimate pastime groves. These kunjas are formed from various trees and vines i.e. asoka, bakula, campaka, kadamba, mango, punnaga, vetasi; and vines of madhavi, malati etc. Many richly blossoming, verdant trees hang luxuriantly over Yamunaji. Brahma Kunda: 5,000 years ago and in 2018, just northeast of the Yogapitha Mandir, which is exactly where the old Govindaji temple stands today, is Brahma-kunda! Gopisvara Mahadeva Mandira: today and then this popular temple is still just northeast of Brahma Kunda! Vamsivata: today and then this lila-sthali is still just northeast of Gopisvara Mahadeva Mandira! Govindaji relaxes on the jeweled dais (ratna-vedi) here to call the gopis to His side with His enchanting murali. 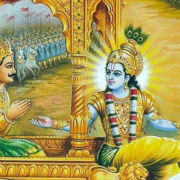 Muralidhara Sri Syama ki jai! Yamuna Pulina: Just north of today’s ancient Vamsivata is a sandbar in Yamunaji where Rasabihari and the gopi ramanis blissfully dance in rasa [invisible today to most]. The brilliant sandbanks along Yamunaji appear brighter than camphor glistening in the moonlight. With her love-excited waves Yamunaji spashes all sides of the rasa-mandala. Hundreds of private pastime madhavi-kunjas and countless celestial flower gardens lie beyond Yamunaji banks. The sensational lotus footprints of Syama and the sakhis can always be found here, and seen even today by some! Water Depth—to blissfully serve Syamasunda’s jala-keli lilas with His beloved damsels, Yamunaji varies her depths to either ankle, knee, waist, chest, head, or super deep waters. Scented Water—shaking the blooming red and white lilies in Yamunaji, excited bumblebees make the fragrant flower pollen fall into the water. Colorful Birds—swans, cranes, humming birds, nightingales, and others sing attractively and play on Yamunaji’s banks. We hope this article will increase everyone’s loving appreciation for Sri Vrndavana Dhama, and also help the sadhaka’s dive deep into the blissful world of lila-smarana and manasi-seva in their beautiful eternal and divine spiritual forms, siddha dehas. Sri Maha Vrindavana Yogapitha ki jai! Sri Sri Radha-Govinda Yugala ki jai! Sri Guru ki jai! Jai Jai Sri Radhe! Part one of Yogapitha meditation is available here. 2018 GITA JAYANTI 5120 BIRTHDAY: How To Properly Observe?